Marshal Skinner the boat’s owner had tried a variety of products to help retain the gloss and shine and minimize maintenance of his 1997 32’ Dakota with little luck. Upon learning the benefits of ceramic coatings Marshal reach out to us for boat detailing in Stuart and application. The boat owner had applied a competitive product just over a year ago which was resulting in cloudiness and fading. This particular product, (according to the manufacturers website) does need to be removed and re-applied ever year, which in itself is a challenge. Obviously the first step in this process was removing the competitive product on Marshall’s boat. This proved to be a long and strenuous task. The first step to removing this product was using a stripping agent with a scotch brite pad. Working in small sections, we sprayed the stripping agent directly on the surface, then scrubbing the surface vigorously with the pad. After completing this step, there were still visible signs of the product on the hull. To completely remove this product, the use of heavy abrasion was required. We were forced to wet sand the hull with 1000 grit sandpaper. We only recommend wet sanding a boat in extreme circumstances because it will remove several layers of gel coat, making the surface extremely porous. After two full days of work, we were able to remove this product, allowing us to begin the steps required to apply our ceramic coating. When dealing with older boats, most times an additional step of heavy duty compound is required to help restore the finish of the boat. After wet sanding the hull, we were left with a very dull and rough surface. Using a Makita rotary buffer, a wool pad, and a heavy duty compound, we began to bring back the surface of the hull. Once completed, the next step was to use Glidecoat Nano Compound. This helped remove the swirl marks from the heavy-duty compound, creating a smooth uniform surface on the hull. The final buffing step was with Glidecoat Nano Polish, which restores the gloss and shine. 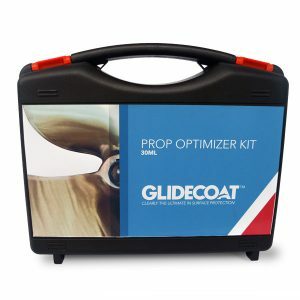 These steps are very critical and an essential part of the process to properly prep the surface prior to applying Glidecoat Liquid Crystal. 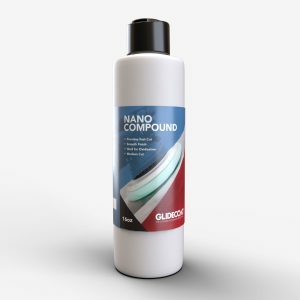 Our product is designed to enhance and protect so all surface imperfections must be removed during the compounding and polishing process. Prior to applying Glidecoat Liquid Crystal we decontaminate the surface with Glidecoat Surface Wipe. 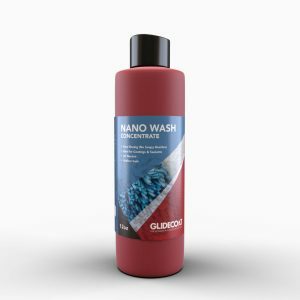 This is an alcohol based product that removes any leftover residue from the compound and polish. 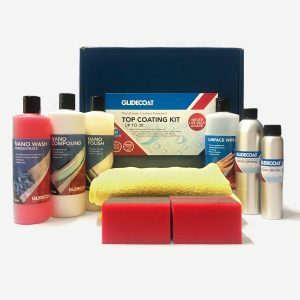 The surface must be clean to allow Glidecoat Liquid Crystal to fill in any pores and bond with the gel coat, providing amazing shine and protection. Working in small 4 foot by 4 foot sections, we poured a dime size of Glidecoat Liquid Crystal onto the application sponge. While applying medium pressure, we covered the entire section with our coating (the surface will appear to be sweating). Then with a clean microfiber towel, we buffed the coating into the surface immediately after applying, not allowing the coating to dry. It is important to use long, consistent strokes, to ensure the coating fills in the pores while also creating a smooth, uniform finish. Moving in small sections, we completed this step on the entire hull, as well as all flat fiberglass surface on the top side. Once completed, we then start the second coat once the initial coat is finger touch dry (about 30 minutes). The first coat provides a base, filing the pores, while the second coat ensures all pores have been filled and bonding with the surface making it shiny and hydrophobic. In some cases, especially on older boats, a third coat may be required. 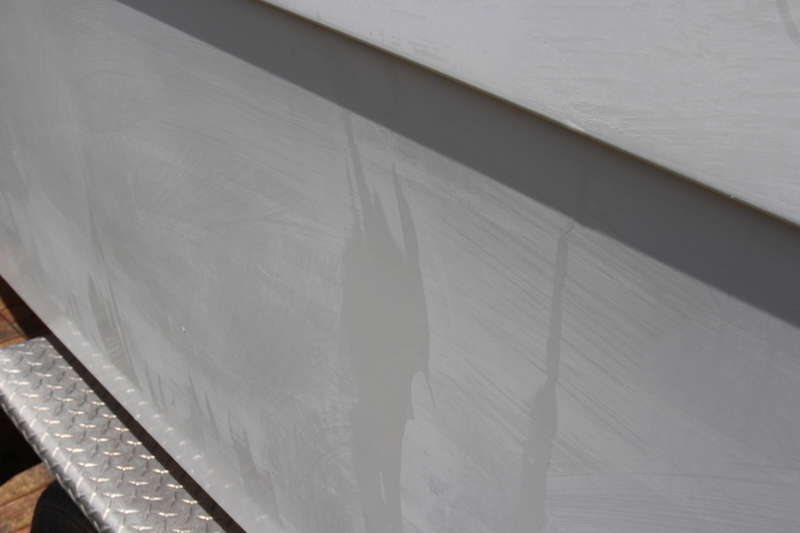 If after two coats, the boat does not have an amazing shine, this will be an indication that an additional coat should be applied. After three days of work, we removed the competitive product from Marshal’s boat and applied Glidecoat Liquid Crystal. Taking the surface from gloss readings as low as 6, to upwards of 78 (brand new gel coat averages 85 on a gloss meter). Our coating will provide this boat with 12-18 months of protection here in South Florida. 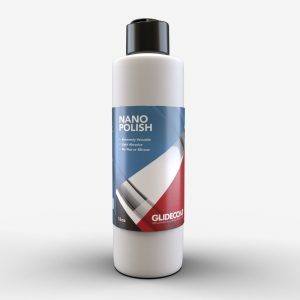 When the time comes for Marshal to have Glidecoat reapplied, our product will not have to be removed. We will repeat our steps; wash, polish, surface wipe, and liquid crystal. We rarely recommend the compound step unless there is any visible sign of oxidization. 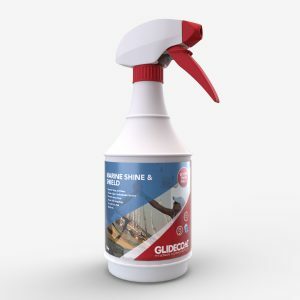 Another benefit to Glidecoat is that each time it is reapplied, it continues to build up the gel coat, allowing for more protection and even further gloss and shine from previous applications. Removing competitive product. Note: swirl marks indicate that the competitive product is still on the surface, requiring wet sanding to remove. My boat looks better than new!